« Next tuesday, new release. 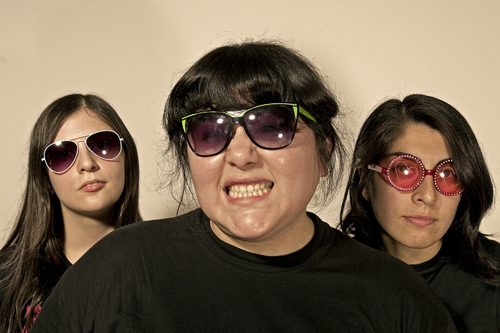 I love all girl punk bands and I was looking for a band that can represent the South American female punk rock sound. And I think that I found it. Las Vin Up was formed in late 2007 in the south of Greater Buenos Aires. The female trio started rehearsing her first punk rock songs with catchy choruses and bubblegum rhythms, with lyrics about rare boys and bizarre situations. After a few practices, the band performed live for the first time in a Buenos Aires venue receiving a great acclaim and enthusiasm from the public, so decided to record his first four songs, collected in their demo entitled “Gordas Putas” while the band continued to playing throughout Buenos Aires and its suburbs. In 2008 the band underwent a change of members and start recording what is their second demo “Año Nuevo Chino,” it features 10 punk rock songs of simple melodies and characters unusual, material that can be heard through your Net Label MAKING BIG and their websites, which have already received thousands of hits from listeners around the world, which was presented on the “Indies Puestas Tour” playing in Buenos Aires and Greater Buenos Aires as well as the towns of Pinamar, Mar Del Plata, Bahía Blanca and the neighboring country of Uruguay. In 2009, the band recorded “Caminata Lunar” an EP with four songs. This EP has being recorded in La Nave de Oseberg studio with Jorge Perini, with a more entrenched and powerful sound. During December 2009 Las Vin Up will playing in the Chicas Rockers Festival. LEPORK RECORDS will be release “Caminata Lunar China” an album that included both albums (“Año Nuevo Chino” and “Caminata Lunar” EP) on December 21, 2009.